Maghemite: Mineral information, data and localities. From the first syllables of MAGnetite and HEMatite, in allusion to the magnetism and composition. A ferromagnetic iron oxide (which may therefore be confused with magnetite). Maghemite is formed by weathering or low-temperature oxidation of spinels containing ferrous iron, commonly magnetite or titanian magnetite. It is a widespread yellow pigment in continental sediments, rocks, and soils. Commonly as coatings on or replacements of magnetite; massive; rarely as minute octahedral crystals, or acicular overgrowths. Cubic (P4132 or P4332), typically with a tetragonal supercell (P41 or P43, a = 8.35, c = 24.99 A).). Hydromaghemite Maghemit with adsorbed water. Goethite 4 photos of Maghemite associated with Goethite on mindat.org. Magnetite 4 photos of Maghemite associated with Magnetite on mindat.org. Hematite 3 photos of Maghemite associated with Hematite on mindat.org. Chalcedony 2 photos of Maghemite associated with Chalcedony on mindat.org. Leucoxene 1 photo of Maghemite associated with Leucoxene on mindat.org. Sosman and Posnjak (1925) Washington Academy of Science, Journal: 15: 329. Wagner (1927) Economic Geology: 22: 845. Schneiderhöhn and Ramdohr (1931) 2: 537. Winchell (1931) American Mineralogist: 16: 270 (as oxymagnite). Palache, Charles, Harry Berman & Clifford Frondel (1944) The System of Mineralogy of James Dwight Dana and Edward Salisbury Dana Yale University 1837-1892, Volume I: Elements, Sulfides, Sulfosalts, Oxides. John Wiley and Sons, Inc., New York. 7th edition, revised and enlarged: 708-709. Contributions to Mineralogy and Petrology (1979) 69: 249.
de Faria, D.L.A., Silva, S.V., de Oliveira, M.T. (1997): Raman microspectroscopy of some iron oxides and oxyhydroxides. Journal of Raman Spectroscopy 28, 873-878. Hanesch, M. (2009): Raman spectroscopy of iron oxides and (oxy)hydroxides at low laser power and possible applications in environmental magnetic studies. Geophys. J. Int. 177, 941-948. Buchwald, V. & Clark Jr, R.S. (1989) Corrosion of Fe-Ni alloys by Cl-containing akaganéite (β-FeOOH): The Antarctic meteorite case. American Mineralogist 74(5&6):656-667. (May-June1989). Dekov, V., Z. Damyanov, G. Kamenov, I. Bonev, I. Rajta, G. Grime. 2001. Sorosite (h-Cu6Sn5)-bearing native tin and lead assemblage from the Mir zone (Mid-Atlantic Ridge, 26oN). – Oceanologica Acta, 24, 3, 205-220.; Dekov, V. M., Damyanov, Z. K., Kamenov, G. D., Bonev, I. K., Rajta, I., & Grime, G. W. (2001). 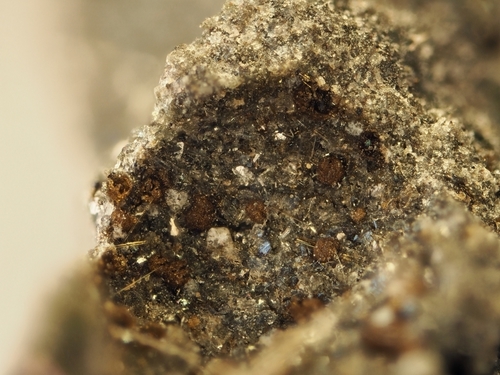 Sorosite (η-Cu6Sn5)-bearing native tin and lead assemblage from the Mir zone (Mid-Atlantic Ridge, 26° N). Oceanologica acta, 24(3), 205-220. Brown, R.E., Brownlow, J.W., Krynen, J.P. (1992) Metallogenic Study and Mineral Deposit Data Sheets, Manilla-Narrabri 1:250 000 Metallogenic Map SH/56-9, SH/55-12. Geological Survey of New South Wales, Sydney, 319 pages. Johnson, D. (1989) Asarco Australia Ltd, Tennant Creek Project, Mammoth Prospect, Mineral Claims C482-484, 514-518, Annual Report to the N.T. Department of Mines and Energy. Taylor, G., & Eggleton, T. (2004). Little balls”: The origin of the Weipa bauxite. In Regolith (Vol. 2004, pp. 350-254). Taylor, G., & Eggleton, R. A. (2008). Genesis of pisoliths and of the Weipa Bauxite deposit, northern Australia. Australian Journal of Earth Sciences, 55(S1), S87-S103. ROSS, J., ROSS, A., & ROSS, G. (1987). Geology of the Mount Gillies rhyolitic vents, southeastern Queensland, Australia. Current science, 56(11), 589-595. Wopfner, H. (1972) Maghemite from Cainozoic sediments at Hallett Cove. Geological Survey of South Australia, Quarterly Geological Notes 43 pg. 5-8. Birch, W.D., Samuels, L.E., Wasson, J.T. (2001) Willow grove: A unique nickel-rich ataxite from Victoria, Australia. Meteoritics and Planetary Science, 36, A247–A254. Birch, W. D. (2008): Gem corundum from the St Arnaud district, Western Victoria, Australia. Australian J. of Mineralogy 14, 73-78. Song, Y., Moon, H. S., & Chon, H. T. (1995). New occurrence and characterization of Niserpentines in the Kwangcheon area, Korea. Clay Minerals, 30(3), 211-224. Hassan, L. Y. (2017). Alteration Associated with the Austin-Quinns VMS Prospects, Northern Yilgarn Craton. Geological Survey of Western Australia, Record 2017/10, 61p. Grguric, B.A. (2003) Minerals of the MKD5 nickel deposit, Mount Keith, Western Australia. Australian Journal of Mineralogy, Vol. 9, No.2 pp.55-71. Schulz, O. (1979): Die Sideritlager in den Paragneisen von Bärenbach bei Hüttenberg, Kärnten. Carinthia II 169./89., 37-57. Vavtar, F. (1986): Das Zinn-Kupfer-Erzvorkommen am Glücksgrat (Stubai-Kristallin). Tschermaks Mineralogische und Petrographische Mitteilungen 35, 287-298. Barbosa, O. (1950) Esclarecimiento sobre e estratigrafia da serie Jacadigo. Min e Metal, 151. Petruk, W. (1963): A manganese occurrence on Queen Charlotte Islands, B.C. Can. Mineral. 7, 670-673. SAGE, R.P. (1981) Geology of the Martison carbonatite complex. Ontario Geological Survey Open File Report 5420, 99p. Maksaev, V., Townley, B., Palacios, C., and Camus, F. (2007): Metallic ore deposits. In: Moreno, T., and Gibbons, W. (editors): The Geology of Chile. The Geological Society (London), pp. 414.
ⓘ Vaca Muerta meteorite ? Rull, F., Martinez‐Frias, J., Sansano, A., Medina, J., & Edwards, H. G. M. (2004). Comparative micro‐Raman study of the Nakhla and Vaca Muerta meteorites. Journal of Raman Spectroscopy, 35(6), 497-503. Marsh, E.E. and Anderson, E.D., 2011, Ni-Co laterite deposits: U.S. Geological Survey Open-File Report 2011–1259, 9 p.
Matýsek D., Jirásek J., Skupien P, Thomson S.N. : The Žermanice sill: new insights into the mineralogy, petrology, age, and origin of the teschenite association rocks in the Western Carpathians, Czech Republic. International Journal of Earth Sciences, doi: 10.1007/s00531-018-1614-x. Jirásek J., Matýsek D. (2018) Revize harmotomu z terciérního neovulkanitu z Ostravy-Muglinova. Bull Mineral Petrolog 26(2): 149-153. Zimák, J.: Mineralogie železných rud na historickém ložisku Horní Hoštice v Rychlebských horách (Česká republika). Bulletin mineralogicko-petrografického oddělení Národního muzea v Praze, 2008, vol. 16, 2, 238-242. Rost R.: Doplňky k mineralogii pyropových štěrků v Českém středohoří. Časopis pro mineralogii a geologii, 1962, 7, 4, 407-417. Žáček V, Skála R., Dvořák Z.: Spinelidy v pyrometamorfovaných horninách Mostecké pánve. Minerál, 2010, 18, 1, 21-31. Tamara Gallardo, Esperanca Tauler, Joaquin A. Proenza, John F. Lewis, Salvador Gali, Manuel Labrador, Francisco Longo, Giovanni Bloise: Geology, Mineralogy and Geochemistry of the Loma Ortega Ni Laterite Deposit, Dominican Republic. Macla no 13. septiembre ‘10, Revista de la Sociedad Española de Mineralogía. T. Sameshima et al. , Am. Min. , 1983, 68, pp. 1076-1082. / C. Campiglio et al. , Bull. Minéral. , 1986, 109, pp. 423-440. Frenzel, G. (1953): Contributions to Mineralogy and Petrology 3(6), 409-444. Paul, M. (1995): Mineralogie, Chemismus und Gliederung der Ni-führenden Verwitterungskrusten auf Serpentinit von Callenberg, Sachsen. Zeitschrift für Geologische Wissenschaften 23, 331-347 (in German). Michailidis, K. M. (1990): Zoned chromites with high Mn-contents in the Fe-Ni-Cr-laterite ore deposits from the Edessa area in Northern Greece. Mineralium Deposita 25, 190-197. Carson, G. L. (2015). Hydrothermal Acid-sulfate Alteration at Krafla and Námafjall, Ne Iceland: Implications for Gusev Crater and Meridiani Planum, Mars. Masters thesis, University of Wisconsin-Milwaukee. Brearley, A. J. & Jones, R. H. (1998). Chondritic Meteorites. In: Planetary Materials (Papike, J. J., Editor): Chapter 3, 398 pages. Mineralogical Society of America: Washington, DC, USA. (1998) ; E.R.D. Scott et al. (1988) Primitive material surviving in chondrites: Matrix. IN: Meteorites and the Early Solar System. Kerridge, J. & Matthews, M.S. -Eds., pp. 718--745: University of Arizona Press: Tucson, Arizona. Mallick, B., Rautray, T. R., Nayak, P. K., Vijayan, V., Singh, P., Behera, R. C., ... & Choudhury, R. K. (2005, March). Characterisation of hot material erupted from Mahanadi riverbank using EDXRF and XRD techniques. In INDIAN JOURNAL OF PHYSICS AND PROCEEDINGS OF THE INDIAN ASSOCIATION FOR THE CULTIVATION OF SCIENCE-NEW SERIES- (Vol. 79, No. 3, p. 293). NOT KNOWN. Nayak, B. K., DAS, RAJEEV, S. K., Muralidhar, J., & Sahoo, R. K. (1998). Four-dimensional trend surface analysis and its implications on the distribution of Ni, Co, Fe2O3, Cr2O3, SiO2 and Al2O3 in the nickeliferous laterite overburden of South Kaliapani chromite deposit, Sukinda ultramafic belt, Orissa, India. 岩鉱, 93(6), 195-206. Brearley, A.J. & Jones, R.H. (1998) Chondritic Meteorites. In: Planetary Materials (Papike, JJ - Ed. ), Chapter 3: 1-398: Mineralogical Society of America, Washington, DC, USA. Murashko, M. et al (2010) Zapiski RMO, 139, 3, 22-30. AA. VV., 1996. Collezionare minerali. Hobby & Work. De Michele, V. (1974). Guida mineralogica d'Italia. Istituto Geografico De Agostini, Novara, 2 vol. Mineralogical Record, 25 (4), 293-299. Powder XRD by John Attard, January 2008. Field trip observations, Alfredo Petrov. Ch. Wagner and D. Velde, Bull. Minéral. , 1985, 108, pp. 173-187. Seltmann, R., & Porter, T. M. (2005). The porphyry Cu–Au/Mo deposits of Central Eurasia: 1. Tectonic, geologic and metallogenic setting and significant deposits. Super porphyry copper and gold deposits: a global perspective, 2, 467-512.
ⓘ San Antonio Mine (San Antonio el Grande Mine) ? M. A. Pérez-Cruz, M. P. Elizalde-González, R. Escudero, S. Bernès, R. Silva-González and Y. Reyes-Ortega (2015): At last! The single-crystal X-ray structure of a naturally occurring sample of the ilmenite-type oxide FeCrO3. Acta Crystallogr. B71, 555-561. Gebhard, G. (1999) Tsumeb II. A Unique Mineral Locality. GG Publishing, Grossenseifen, Germany. 284 (in English). Courtney, S.F., King, P. & Rodgers, K.A., (1990). A Check List of Minerals from the Tui Mine, Te Aroha, New Zealand. New Zealand Natural Sciences 17: 95-98. Spratt, P.R., Rodgers, K.A. (1975) The Ngatutura Volcanics, Southwest Auckland. Journal of the Royal Society of New Zealand, 5:2, 163-178. Mücke, A., Badejoko, T.A., and Akande, S.O. (1999): Mineralium Deposita 34, 284-296. 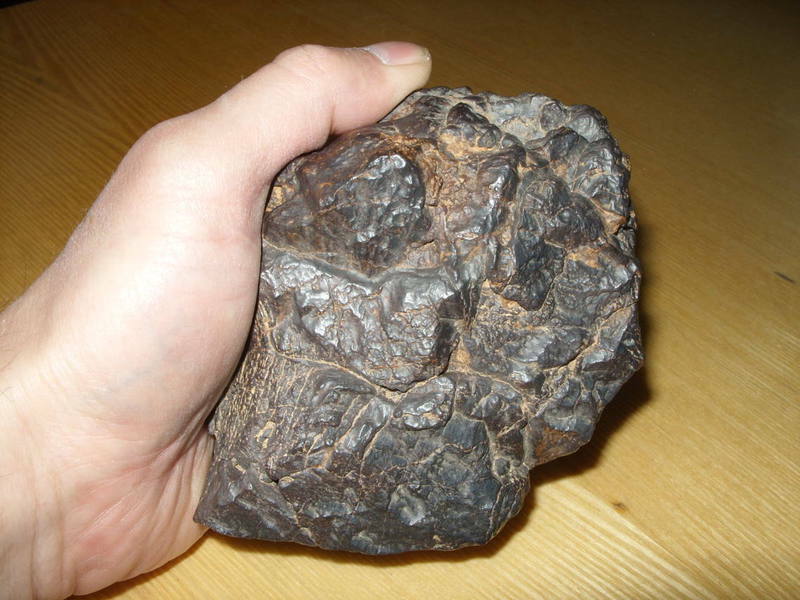 Dr. Vivian Gornitz (2013) A "wet" Mars meteorite from the desert. Bulletin of the New York Mineralogical Club, 127, #4, 3. Mochnacka, K., Oberc-Dziedzic, T., Mayer, W., & Pieczka, A. (2012). Ore mineralization in the Miedzianka area (Karkonosze-Izera Massif, the Sudetes, Poland): new information. Mineralogia Polonica, 43(3-4), 155-178. Mochnacka, K., Oberc-Dziedzic, T., Mayer, W., & Pieczka, A. (2015). Ore mineralization related to geological evolution of the Karkonosze–Izera Massif (the Sudetes, Poland)—Towards a model. Ore Geology Reviews, 64, 215-238. Udubasa, G., Hartopanu, P., Ilinca, G. (1996). The Regionally metamorphosed Fe-Mn Ore Deposit at Razoare, Preluca Mts., Romania. Romanian Journal of Mineralogy, 77, 3-20. Belykh, V.I., Dunai, E.I., and Lugovaya, I.P. (2007): Geology of Ore Deposits 49(2), 147-159. Righter & 27 others (2015) Mineralogy, petrology, chronology, and exposure history of the Chelyabinsk meteorite and parent body. Meteoritics & Planetary Science 50 (10): 1790-1819. (Oct 2015). Talovina, I.V., Lazarenkov, V.G., and Vorontsova, N.I. (2003): Lithology and Mineral Resources 38(5), 403-415. 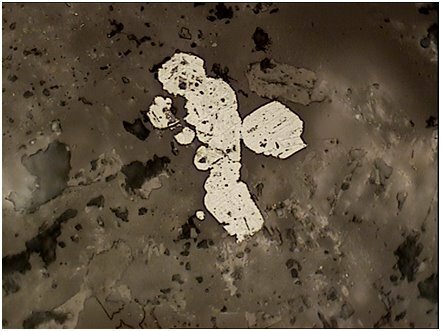 Skvortsova V, Samoylovich M, Belyanin A (2014) Iron containing surfaces of contact of diamond with kimberlite. 21 st meeting of the International Mineralogical Association. Gnos, E., Hofmann, B. A., Halawani, M. A., Tarabulsi, Y., Hakeem, M., Al Shanti, M., ... & Ramseyer, K. (2013). The Wabar impact craters, Saudi Arabia, revisited. Meteoritics & planetary science, 48(10), 2000-2014. Bowles, J. F., Suárez, S., Prichard, H. M., & Fisher, P. C. (2018). The mineralogy, geochemistry and genesis of the alluvial platinum-group minerals of the Freetown Layered Complex, Sierra Leone. Mineralogical Magazine, 1-30.
du Plessis, G., Jonck, G.J., and Kruger, R. (1997): Mineralium Deposita 32, 362-370. Andreoli, M. A., Ashwal, L. D., Hart, R. J., Huizenga, J. M., & Ni, A. (1999). Ni-and PGE-enriched quartz norite impact melt complex in the Late Jurassic Morokweng impact structure, South Africa. Special Papers-Geological Society of America, 91-108. -Calvo, M. (2008). Minerales de Aragón. Prames, Zaragoza, 463 pags. ⓘ Fra Joan Mine ? Stalder, H. A., Wagner, A., Graeser, S. and Stuker, P. (1998): "Mineralienlexikon der Schweiz", Wepf (Basel), p. 261. Cabri, L. J., Wilhelmij, H. R., & Eksteen, J. J. (2017). Contrasting mineralogical and processing potential of two mineralization types in the platinum group element and Ni-bearing Kapalagulu Intrusion, western Tanzania. Ore Geology Reviews, 90, 772-789. Akinci, O. T. (2009). Ophiolite-hosted copper and gold deposits of Southeastern Turkey: formation and relationship with seafloor hydrothermal processes. Turkish Journal of Earth Sciences, 18(4), 475-509. Kines, M. T. (1969). The geology and the ore mineralization in the Keban area, east Turkey (Doctoral dissertation, Durham University). Ford, T., A. Sarjeant & M. Smith (1993): The minerals of the Peak district of Derbyshire. UK Jour. Mines & Minerals 13, 16-55. Hofmann, B. A. (1992). Uranium accumulation during weathering of Canon Diablo meteoritic iron. Meteoritics, 27(1), 101-103. Anthony, J.W., et al (1995), Mineralogy of Arizona, 3rd.ed. : 282, 403; Gigl, P.D. & F. Dachille (1968), Effect of pressure and temperature on the reversal transitions of stishovite, Meteorites: 4: 123-136; Mead, C., et al (1965), Metallic spheroids from Meteor Crater, AZ, Am.Min. : 50: 667-681. Theodore, T.G., et al (1987), USGS PP 1361: 43-44, 141 (Table 11). Anthony, J.W., et al (1995), Mineralogy of Arizona, 3rd.ed. : 282. Newhouse, Walter Harry & J.P. Glass (1936), Some physical properties of certain iron oxides: Economic Geology: 31: 701; Murdoch, Joseph & Robert W. Webb (1966), Minerals of California, Centennial Volume (1866-1966): California Division Mines & Geology Bulletin 189: 246. Wiese, J.H. & L.R. Page (1946), Tin deposits of the Gorman district, Kern County, California: California Journal of Mines and Geology, California Division Mines (Report 42): 42(1): 31, 49; Murdoch, Joseph & Robert W. Webb (1966), Minerals of California, Centennial Volume (1866-1966): California Division Mines & Geology Bulletin 189: 246; Pemberton, H. Earl (1983), Minerals of California; Van Nostrand Reinholt Press: 161. Wiese, J.H. & L.R. Page (1946), Tin deposits of the Gorman district, Kern County, California: California Division Mines Report 42: 51; Murdoch, Joseph & Robert W. Webb (1966), Minerals of California, Centennial Volume (1866-1966): California Division Mines & Geology Bulletin 189: 246.; emberton, H. Earl (1983), Minerals of California; Van Nostrand Reinholt Press: 161. Wiese, J.H. & L.R. Page (1946), Tin deposits of the Gorman district, Kern County, California: California Division Mines Report 42(1): 47; Pemberton, H. Earl (1983), Minerals of California; Van Nostrand Reinholt Press: 161. Murdoch, Joseph & Robert W. Webb (1966), Minerals of California, Centennial Volume (1866-1966): California Division Mines & Geology Bulletin 189: 247. Sosman, Robert Browning & E. Posnjak (1925), Ferromagnetic ferric oxide, artificial and natural: Journal of the Washington Academy of Science: 15: 332; Newhouse, Walter Harry & J.P. Glass (1936), Some physical properties of certain iron oxides: Economic Geology: 31: 701; Kinkel, Arthur Rudolph, Jr. & J.P. Albers (1951), Geology of the massive sulphide deposits at Iron Mountain, Shasta County, California: California Division Mines Special Report 14: 9; Kinkel, Arthur Rudolph, Jr., Wayne E. Hall & J.P. Albers (1956) Geology and base metal deposits of west Shasta copper-zinc district, Shasta County, California: USGS PP 285, 156 pp. : 119. Weissman, Jeffrey G. and Anthony Nikischer. (2005): PHOTOGRAPHIC GUIDE TO MINERAL SPECIES. 2nd edition. CD distributed by Excalibur Mineral Corporation. Ramdohr, P. (1973). The Opaque Minerals in Stony Meteorites. Elsevier Publishing Company: Amsterdam; London: New York. 245 pages. Minerals of New Mexico 3rd ed. ⓘ Lone Jack Quarry ? Rye, R. O., Breit, G. N., & Zimbelman, D. R. (2003). Preliminary mineralogic and stable isotope studies of altered summit and flank rocks and Osceola Mudflow deposits on Mount Rainier, Washington. US Department of the Interior, US Geological Survey. Gilmore, M., Treiman, A., Helbert, J., & Smrekar, S. (2017). Venus surface composition constrained by observation and experiment. Space Science Reviews, 212(3-4), 1511-1540.